Meg Ryan and Tom Hanks' AOL-era romantic comedy crash-landed into our inboxes 15 years ago. It's been 15 years since the classic rom-com "You've Got Mail" crash-landed into our inboxes (or did we mean to say VCRs? Remember those?). The unlikely plot would be even more impossible today (hey, Facebook): anonymous online pen-pals fall in love on the 'Net, never realizing that in real life, he's a big-box bookstore guy driving her indie children's bookshop out of business. Yet we still can't help but love this movie like Tom Hanks loves Meg Ryan. So in honor of the 15th anniversary, we've got ... 10 things you may not have known about the Nora Ephron movie. Sometimes the greatest lines from movies are a result of mistakes. The first time Hanks' character goes to the Ryan's Shop Around the Corner, he's carrying balloons and a goldfish. On his way out of the store, he accidentally slammed the balloons into the door. Hanks' ad-lib, "good thing it wasn't the fish," made it into the final cut of the movie. The name of Ryan's character's bookstore, The Shop Around the Corner, is also the title of the 1940 Jimmy Stewart movie of the same name upon which Ephron's flick is loosely based. When Ryan's and Hanks' characters finally meet in person, with both knowing that they've been emailing each other, the song "Somewhere Over the Rainbow" plays on the film's soundtrack. The duo also shared a scene set to the song in "Sleepless in Seattle." A baby-faced, pre-fame Chris Messina played the Fox Books salesman who gets schooled by Ryan's character. Come on, man, you're a bookseller! It's about time you read the "Shoes" books. 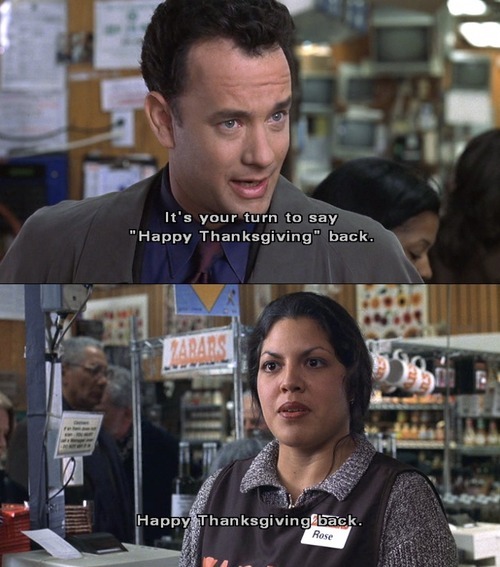 In a blink-and-you'll-miss-it moment, Ramirez (later of "Grey's Anatomy" fame) had her onscreen debut in "You've Got Mail." She played the Zabar's cashier who was very serious about her line's cash-only policy. Wonder Where the Bookstore Is? The Shop Around the Corner is based on the real-life store Books of Wonder in New York's Chelsea neighborhood. The store still has props from the film on display, and Ryan reportedly worked the counter for a day as research for her role. Hanks' character says that he's obsessed with "The Godfather," but he misquotes the movie when he first meets Ryan's character. "I didn't know who you were with," he says, but the line is: "Why didn't you say you worked for Corleone, Tom?" The store that stood in for The Shop Around the Corner during filming was actually a cheese-and-antiques shop. The filmmakers sent the owner on vacation while they filmed, and reassembled her shop before she returned. 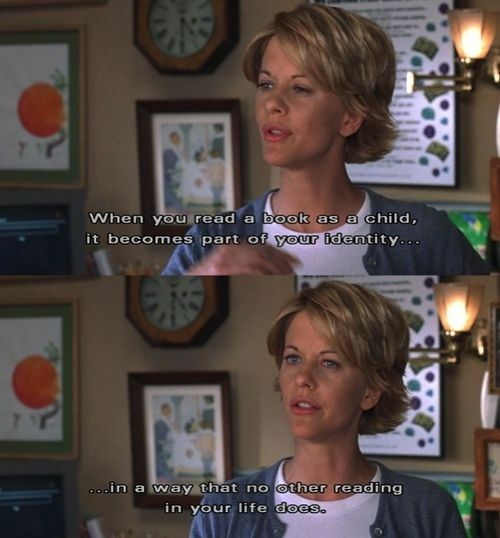 The Fox Books mega-chain of "You've Got Mail" was a stand-in for Barnes & Noble, which was perceived to have put smaller bookstores out of business with its expansion. (Nora Ephron, who co-wrote the script with her sister Delia Ephron, is said to have taken inspiration from the opening of an Upper West Side Barnes & Noble that competed with the independent store Shakespeare and Co.) In the Amazon era, however, Barnes & Noble eventually shuttered some of its own locations as the business changed and consumers increasingly turned to e-readers and discount online book sellers.